"Aquatica Plus UK ships 4kw Titanium & Stainless Steel Pond Heater-Cloverleaf from Amazon.co.uk. Amazon.co.uk has fast shipping in the UK and often free shipping on pond and aquarium supplies. Add to your basket now while supplies last to avoid delays." 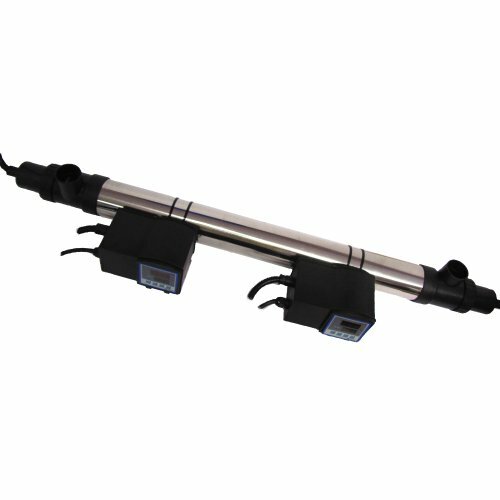 IP55 rated, EU, TUV and UL approved. The new Cloverleaf Stainless Steel Pond Heater is manufactured using the finest materials available today. With a 316L stainless steel body; the highest grade produced and a Titanium heating element the Cloverleaf Pond Heater is the most efficient of its type in the world. With unique and state of the art intelligent digital thermostat the heater can sense water flow reduction and prevent dry burn out. A complete installation kit is supplied including mounting brackets, easy release couplings plus universal hose tails for flexible pipe when solvent connection is not required. We suggest that, on average, 1kw of power is suitable per 1000 gals (4450ltrs) of pond water. It is IP55 rated. EU, TUV & UL approved.